Dirk Nowitzki, our city's hero, shared his final home game with Dallas on Tuesday night. It’s almost impossible to imagine the Dallas Mavericks without Dirk Nowitzki. There were 21 seasons, 31,000-plus points, a league MVP, a Finals MVP, and a championship. About as significant a career as you can ask for. He may be the last superstar to play an entire career with a single team: 41.21.1. When he was drafted in 1998, Ron Kirk was mayor and Bill Clinton was president. 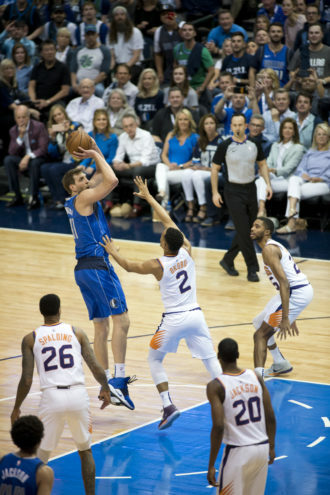 The Mavericks billed their Tuesday night game against the Phoenix Suns, the final home game of the season, as a celebration to honor Nowitzki’s 21 year legacy. By the end of the night, there wasn’t a dry eye in the building. “As you guys might expect, this is my last home game,” Nowitzki said into a microphone, crying at center court. All season, Nowitzki played coy about his future in the NBA. When asked about retirement, he always deferred, saying he’ll wait and see how his body felt come summer or whether his wife, Jessica, will give him permission to play another year. He never wanted to make this season about him. There was no marketing push, no #OneLastDance. He never wanted a farewell tour. He got one anyway. It began on the road against the Charlotte Hornets in early January. The chants started slowly before ballooning into a cacophony. “We want Dirk!” the crowd at the Spectrum Center bellowed. “We want Dirk!” It soon spread across the league. Opposing arenas took to their feet to cheer on the Mavericks legend, seeing him play for the final time. Clippers coach Doc Rivers stopped a game in Staples Center to thank him. It’s not easy to put into words what Nowitzki means to Mavericks fans. It’s even harder to express what he means to the city of Dallas. Yet, it’s impossible to say that his unwavering presence didn’t have a lasting impact. With each passing season, Nowitzki lent his personality, his struggles, and his triumphs to that of the fans and city. Both grew, learned, and became better together. That sentiment rings true for more than just Carlisle. For the past six seasons, I’ve had the privilege of covering the Mavericks and seeing Nowitzki first hand, on the court and off. In those encounters, I found him to be one of the more genuine people who is in the public eye. He’s everything that Carlisle says he is, but most of all he’s humble. Dirk knew how to rise to the occasion on the court, but off it he shied away from the spotlight. When asked about personal achievements or milestones, he had a tendency to downplay his achievement, preferring instead to focus on the team. His sense of humor burned brightest. Even when he was feeling down—maybe a bad loss or a lingering injury—he would hit the media scrum around his locker with a biting, self-deprecating one-liner that would send the press rolling. Playing in the NBA is what people will remember most about him. However, for Nowitzki, it was always about more than just basketball. During the second quarter, the jumbotron flickered to life with images of Dirk visiting Children’s Medical Center Dallas at Christmastime. Narrated by the Dallas Morning News’ Brad Townsend, it tells the story of “Uncle Dirk,” as he is known to the children, as he spends hours with them each year—no media allowed. After the video Tuesday night, Nowitzki wiped away tears. This isn’t a one-off situation. Just last week, Nowitzki stayed late after a game to meet 17-year-old named Hayden, a basketball player and cancer patient from Oregon. As part of a Make-A-Wish Foundation dream, Hayden was able to shoot around and work on his game with Nowitzki and his longtime shooting coach, Holger Gerschwinder. Back on the court, Nowitzki shook off the tears, and his age, as best as he could on his way to a stat line reminiscent of days past: 30 points, eight rebounds, three assists, and a block. It was his highest scoring output of the season, a season that has taken its toll on his body. Dirk missed the first 26 games this year, recovering from an ankle injury that resulted from surgery last April. While he was able to return and work himself back into playing form, his body fought back. He underwent countless treatments, including dry needling, just to set foot on the court. The constant battle never dampened his spirits when it came to competition, but it slowly took the fun away from the game. That’s when what made him realize that this season would be his last. After all the accolades, the tribute videos, the chants, the cheers, the Migos from the PA, Dirk Nowitzki stood at center court, surrounded by his idols—Charles Barkley, Larry Bird, Shawn Kemp, Scottie Pippen, and Detlef Schrempf. He received the farewell that he deserved, that so few have received. The fans never left their feet as they watched him navigate through the emotions that tried to overcome him. They hung on his every word and matched it with deafening applause as they watched perhaps the greatest athlete in Dallas sports’ history head to the locker room for the final time. I’m not alone when I say I’ll miss him too.